In a battle of field goals up until the waning stages of the game, the San Antonio Commanders outlasted the Salt Lake Stallions, 19-15, to keep their place atop the Western Conference. The Commanders are looking more and more like the team to challenge Orlando for the top spot as they utilized a strong defensive performance and key plays from their offense (and what you would call special teams) in the victory. The game went to halftime with the Commanders leading by three after the two teams combined for three field goals and a Mekale McKay touchdown reception from QB Logan Woodside, as San Antonio grabbed a late 9-6 lead. Taylor Bertolet hit his second 50-plus yard field goal early in the third quarter to tie it up, but that was where the battle of the kickers would end. Spelling the aforementioned Woodside, who was injured late in the second half, QB Marquise Williams connected on a 36-yard pass to RB Trey Williams for the second touchdown pass of the evening for the Commanders as they also hit on the 2-point conversion to take a 17-9 lead. Williams attempted just three passes, completed two for 49 yards and the eventual game-winning score. He also ran the ball six times for 19 yards, tying for the team-high in rushing yards. All the offensive talk aside, the Commanders defense played well all evening, keeping the Stallions out of the end zone until the 1:54 mark of the fourth quarter when Salt Lake QB Josh Woodrum hit Terrell Newby for a 21-yard touchdown pass to bring the score to 17-15 in favor of San Antonio. But that’s all the points the San Antonio defense would allow before putting up points of their own when De’Vante Bausby intercepted the ensuing 2-point conversion attempt and returned it for two points for his own team in the process. 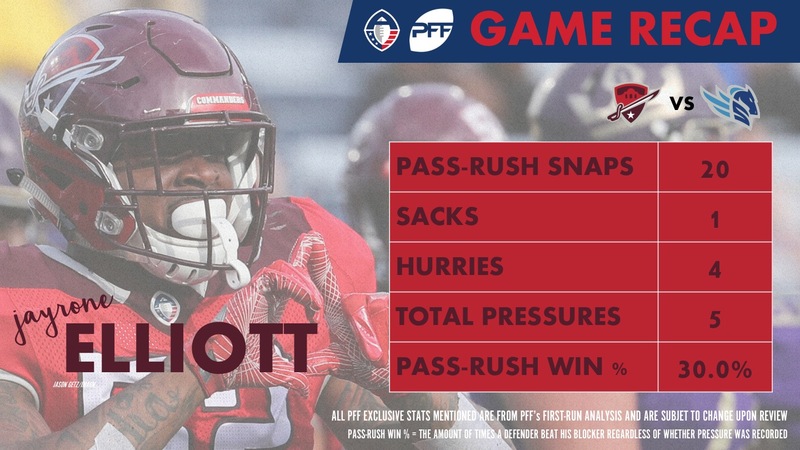 Also on defense for the Commanders, Jayrone Elliott once again continued his excellent play through the 2019 season, registering five pressures and a 30.0% pressure rate in the process. San Antonio has now won four straight and looks to be in control of their destiny as we inch closer to the playoffs.